To update or change your account email, sign into your Punchbowl account and click on your name at the top of any page to link to your Account Settings (you can also directly access this page here). 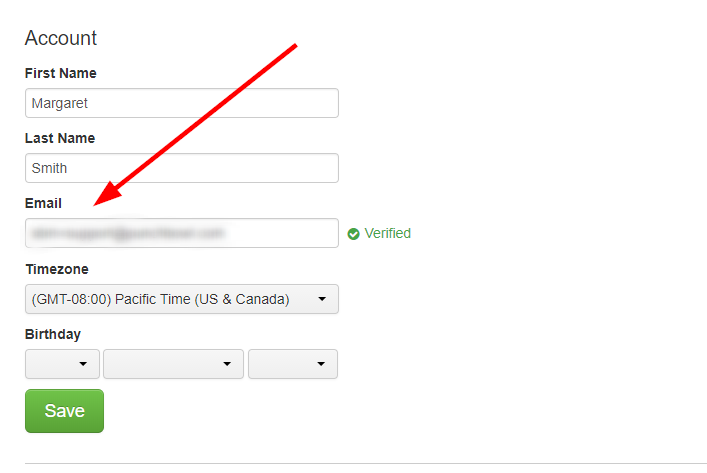 In the center column, under the Account section, you can update the account name and email address. Just enter the new email address and click Save. You cannot change the account email to one that is already in use by another Punchbowl account. This email address will become the primary email that you use to log in going forward. You cannot change the account email to one that is already in use by another Punchbowl account. This email address will become the primary email that you use to log in going forward. As the email is unverified, you will see an "Unverified Email" message above the new email. This just means you will have to verify the email account before you can send an invitation. To update or change your account email through the iOS or Android app, sign into your Punchbowl account and click on the Account tab. Click on Edit Account and you will see your account name and email address. Enter in your new email address and click the green Save button at the bottom. Having trouble? Just contact us and we'll help you figure it out.